For some years, Massachusetts-based hymn expert Peter Meggison has been working to keep classic devotional hymns alive by commissioning new recordings of them. Having made over a dozen sessions with choirs and small ensembles, he distributes the songs on CDs and on the web. 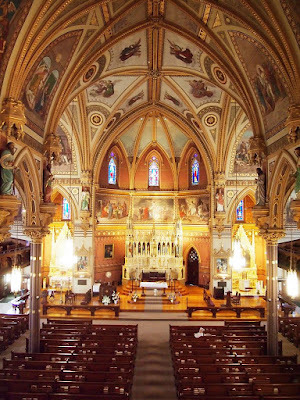 Most of the music on the site is from the era 1850-1950, and represents popular hymns sung at Catholic Masses and devotions in America and England. This summer he collaborated with conductor and organist Michael Olbash to offer something different. Instead of late-Victorian hymns in English, the aim was to present a once-familiar sound from the traditional Mass itself: the sound of the Latin chants of the Requiem Mass, sung with organ accompaniment. A choir of 11 met for an afternoon in St. John Church in Clinton, Massachusetts in June to perform the music, and it is now available on the project’s website.